Although this site is primarily about metal detecting, it is also a portal to the eventful history of the United Kingdom. I hope you find your time here interesting and informative. 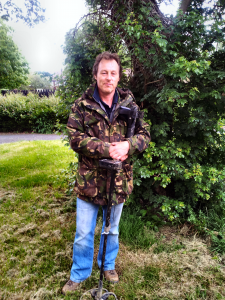 As an often frustrated detectorist due to work commitments and also lack of permissions at certain times of the year, I have created this site as the next best thing to keep myself involved in my favourite pastime. I do not consider myself to be an expert, but I do have have a five-year ‘jump’ on newbie detectorists, so this is where I will set my stall. Aimed at the British beginner detectorist, there are articles about the more common finds such as coins and buttons. There’s also metal detecting tips and advice on cleaning methods and links to cool sites and resources of interest to the metal detectorist. Let me know if you know of any yourself! I’ve just a quick question…. I’ve just got permission to detect on the crown foreshore estate, but i am having a bit off a problem… it says that I can go metal detecting in the areas on the map marked purple, but on their maps on most of it there is sandy coloured sections in front of the purple and inbetween the purple..???? what are those areas ?? I’m not seeing the sandy colour. I would like to talk to you about your tracking software and wonder if I could please call you at a convenient time. I am working on a project that requires accurate tracking information and would very much welcome your advice on a couple of specific points. Thank you. trips(l live in the area of Pembroke)Iam retired so time is of a problem. I wish I could take you up on your kind offer, but I think Milton Keynes is a bit too far away 🙁 I will ask in some of the more populated forums for you. It’s nice to have a bit of company sometimes. Hi ya buddy,long time no contact!! My fault,long story! !nothing bad though!! I used to live for a while in Newport Pagnell,well someone had to!! No,seriously, I quite enjoyed it,all to do with work though but now retired as previously said I live in West Wales,and we(me Mrs &me) love it to bits,very,very quiet. Howdy! Thanks for this application. I was thinking that this exact needed to be done, and you done it.. I have a Samsung Galaxy S4 and for the life of me I cannot see where to turn off my Sensor Aiding. I guess not all devices have that option. If you can’t find it, you probably haven’t got it! I would also recommend turning off location services and using gps only. Thanks for trying Tect O Trak. Hi I live in South Africa and have been finding a few British military buttons around a fort near East London. They are from the frontier wars in the 1800s and I would love to identify them. I purchased a book named Discovering British Military Badges ans Buttons but it is a total wast as the pictures are unclear. I’m not sure about books. . My own library is limited to Spink’s ‘Coins of England 2014’ and the internet! 😛 I think the best way to get your buttons identified would be to post some pictures on specialist forums, particularly on facebook. Some smart Alec is sure to know! An excellent link and metal detecting resource. Thank you Gary! Hello I’ve just found your great site and posted a question on the newbie bit somewhere,,,,,,just asking what is the best detector .I’m looking on eBay as can’t afford New .could I ask which are good so I can find a used one. Be Very grateful for this thanks Robbie.